Discussion in '1940' started by Bazzo, Feb 23, 2014. Hallo everyone, new here, so sorry if this is in the wrong area. I’m trying to find some information on my Grandfather, Andrew Hutchison attested to the 4th or 5th Battalion the Black Watch in May 1939. As it was in Dundee I presume it was the 4th Battalion. That’s him on the right of the photo. He was reported missing on the 13th of May 1940 and spent the rest of the war as a POW in Stalag 20a in Thurn Poland. Can anyone tell me please where the 4th Battalion Black Watch was in France, round about 13 May 1940? The action of 13th May 1940 for 4 Black Watch is described in pages 31 to 36 in Saul David's book ''Churchill's Sacrifice of the Highland Division''. They were on the Saar Front & lost 6 killed, 25 wounded and about 30 PoW. I'm sure Andy has the war diary for 4 Black Watch. Shame you don't know his Company - I could tell you virtually where he was when he was captured from the sketch map mentioned above in the diary. I know very little about my Grandad, he was dead by the time I was born. We just lately managed to find out he was in the Black Watch. His number was 2 757 728. Attached is his ABF 102, maybe some of it makes more sence to you two than me. I note that image 2 shows "in Allied hands in Odessa", from this I would assume his camp was one of those liberated by the Russians, as there is another thread where someone is looking for details of their grandfather who escaped and was picked up by the Russians (http://ww2talk.com/forums/topic/52145-captured-at-st-valery-and-sent-to-stalag-xxb/) and he too was repatriated via Odessa (then by ship to Malta, and finally back to the UK). I cannot find your grandfather recorded on "All UK, British Prisoners of War, 1939-1945 Results" on Ancestry by name (although there are 5 A Hutchison's), service number 2757728, or the number 9410 (which I assumed as possibly being his POW number), but that is the same as the other thread. It almost seems as those Allied POW's that were 'liberated' by the Russian advance have not been recorded anywhere, I am trying to find out if there is any listings, but perhaps your grandfather did complete a Liberation Questionnaire, others on the site will be able to help you out with that. It also confirms he was indeed in 4th Bn as in post #1 you weren't sure. Thanks very much to you all, the family (who are still alive) didn't really know that much about his time in the services. I know that my Gran used to say he was "locked up by the Germans with Sam Kydd" but you never really take it in. Owen You say "it also confirms he was in the 4th" what is "it"? I assumed he was in the 4th because he attested in Dundee and the 5th didn't go to France. Is there something else there? This date appears to be based on a postcard sent by him on arrival in a Stalag- presume usual captivity card via Red Cross?- as recorded on his AFB 200. Drew, yes of course thanks, and to all of you who have repleid, it is much appreciated. If you want to know what POW life was like Sam Kydd wrote an excellent book about his wartime experiences in a POW camp after an eventful weekend trip to Calais in May 1940 ! Duiring the 1950s I believe it was compulsory to a have Sam Kydd in any war film , often popping out of a hatch on a destroyer with a cup of char ! Was Andrew married when he was taken POW and possibly in Germany 1st before his time in Poland? There is a Private Andrew Hutchison reported missing article in the Dundee Courier paper (see attached). This private was married though. Article also appears to have a photograph, but you would need to subscribe to either 'findmypast' or 'Britishnewspaperarchive' to view it. 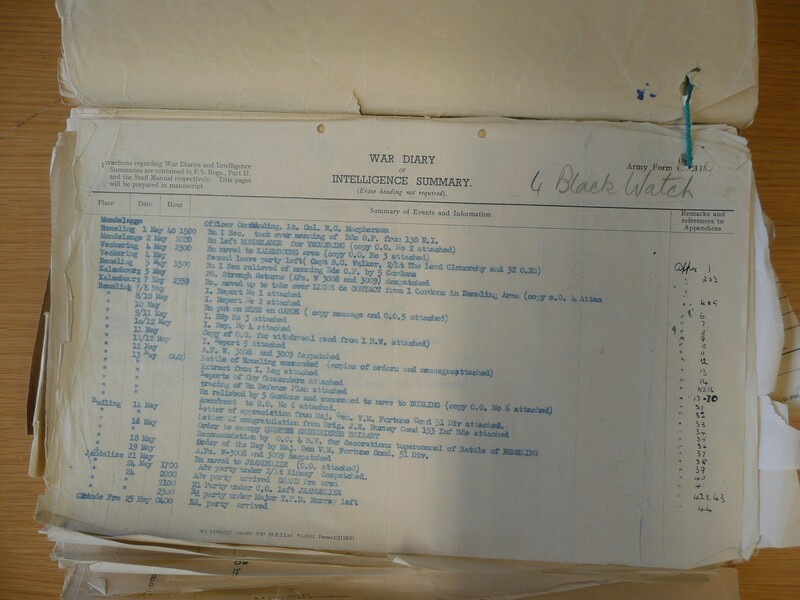 Of interest there are 113 articles regarding the Black Watch from this time. I had a quick look through the items and there was a Lance Corp. Albert Mudie 2750587 4th BW who died exactly on 13 May 1940 (according to the CWGC). Had a look at 'Scotlandspeople.gov.uk' and found 3 Andrew Hutchison's born in 1911, but only one in the Angus region, which I assume would be your Andrew. This entry gives the middle name of Dalgety. Again, if you were to purchase credits you could open this birth entry and obtain details of his parents, address etc. If he also married and died in Scotland this is the website to use to gain that information. Bazzo and Tricky Dicky like this. JCB, thank you, I'll have a look and see if I can get it, although I'm waiting from Saul David's book from Amazon that Owen recommended. There was quite a few captured in May 1940, maybe it was for the better. Sam Kydd was probably a bit underrated. Amberdog, correct his middle name was Dalgetty, at the time of capture he was married to Alice Gibb, in 1947 he married my grandmother Mary Welsh. I have most of his personal details but what was missing was his army time, as I said somewhere above we only just found out recently that he was in the Black Watch (TA). I'll check out your links, thanks. Thanks again for the interest and help. I'm impressed with the help and friendliness shown by the members on this forum. Amberdog, this is from the Courier Link in your post. Hi Mike, just spotted the Courier article. It's fantastic when a photo is printed as well.